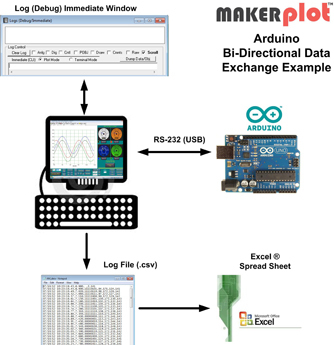 MakerPlot is Windows® software for plotting and data logging analog and digital data generated by your microcontroller and other devices with ASCII serial outputs. No proprietary hardware is required – just a serial connection from your microcontroller or other device to your PC – that’s it! 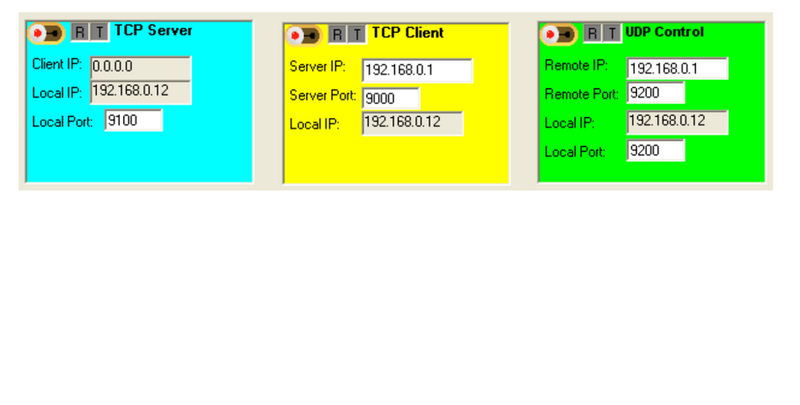 And now you can also use TCP/IP to connect MakerPlot to your micro via the Internet! With dozens of meters, buttons, switches and text boxes you have full control of the screen interface design and how information is displayed, plotted, logged to files, printed and more. Your microcontroller also has the ability to read information directly from the interfaces for interactive measurement, plotting and control. Plus, you can build GUI interfaces with control instruction directly from your micro. 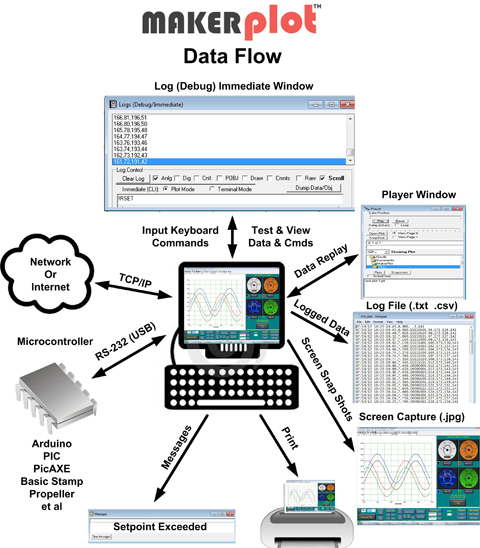 The ability to design a customized GUI interface to monitor your data combined with the ability to program your microcontroller to interface directly with the GUI is a powerful combination for a developer. We named it MakerPlot for those “Makers” desiring to create simple yet powerful interfaces for their projects and products, either for monitoring data and/or with control actions that affect the GUI and a user's experience with it. MakerPlot is compatible with most popular microcontrollers that output serial asynchronous data at standard Baud rates in the conventional RS-232 format including serial-to-USB devices like those from FTDI and MicroChip. These include Arduino® shields, PIC® , PicAXE® , Basic Stamp® , Propeller® , BasicX® , Intel, Motorola, TI, et al. (trademarks for these products are property of their respective companies). 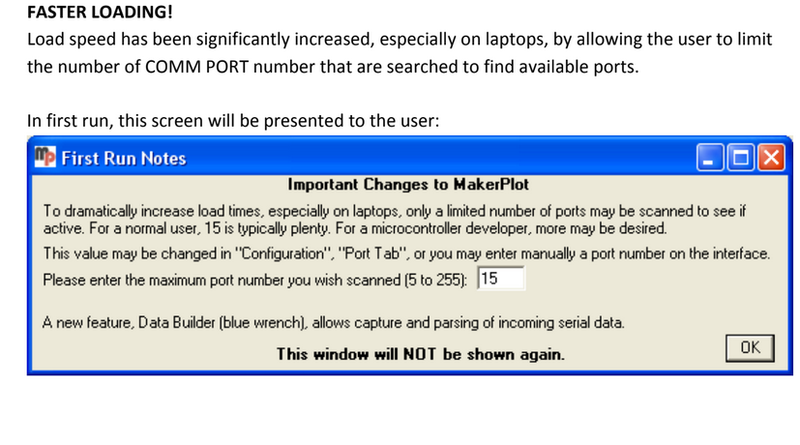 And there's no proprietary hardware required to attach MakerPlot to your micro...simply a serial connection...as well as TCP/IP for remote monitoring! GUIs are the graphical screens that MakerPlot uses to plot, scale and log analog and digital data. Your FREE trial version and purchased licenses come with all of these. The new ones (on the right) allow up to 3 serial ports to be open at the same time, which means that you can have up to 3 micros attached to the same PC and plot each one's data on the same interface display. NEW THINGS - Lots of new features are always being added to MakerPlot...like new interfaces that allow you to plot from 3 separate micros along with TCP/IP data acquisition and control via the Internet, faster loading, direct serial input from scales, GPS and other instruments..and stay tuned for more enhancements! As its name implies, MakerPlot is software that allows you to build custom interfaces to measure and control the analog and digital data from your microcontroller. With MakerPlot your PC now becomes a laboratory instrument. Each interface screen can be created with dials, meters, buttons, switches and message areas that display and control your micro’s data and internal functions. Meters can be configured with alarm settings (both high and low) then made to sound audio tones using any WAV file you select from the library. Use any of our interfaces that come standard or create your own...that's the power of MakerPlot. If you or your company require custom, ready to run interfaces for your application, we will be happy to quote on such work. This means that it will run "out of the box" without any customer tweaking or knowledge about how MakerPlot works. And it will make your hardware solution for their problems that much more powerful. 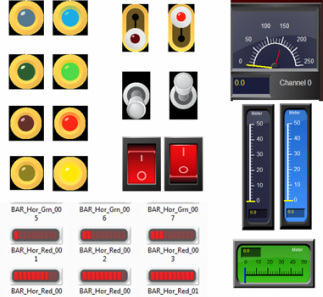 We can work with you to create unique interfaces for your graphical data display and data logging applications including custom graphics for backgrounds, switches, buttons, etc. along with incorporating your company logo in the design. We've provided a complete reference to "all that is MakerPlot" in our Guide. You can use it to program MakerPlot to your own liking. Then find hints on how to do things you never thought that MakerPlot could do. It's all here. Text messages and audio alerts inform you when data conditions meet or exceed your settings. You can even set min and max alarm points on meters to alert you by playing WAV files of your choice. Many meter, switch and LED styles are available with choices of color backgrounds that can correspond with your interface color scheme or alarm conditions. 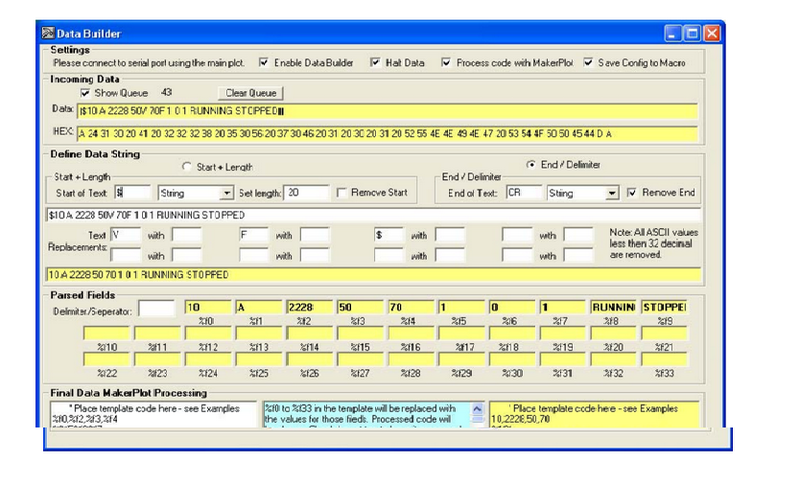 Easy to use menu controls allow adjustment of the baud rate, comm port, data format, X and Y axis scales, data logging, screen capture, printing and overall screen settings. Use our standard menus - modify them - or create your own from scratch! Analog and digital data can be logged to standard .txt and .csv files and be exported into spread sheet programs like Excel ©. There is even a Player function that can playback the latest data on the screen for immediate inspection and analysis. 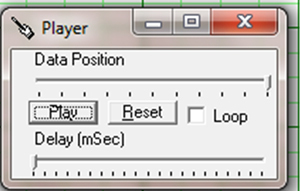 These player files can be stored as .plt files for later analysis and playback. View how the Player function works in our Basic Plotting Video Tutorial Series. 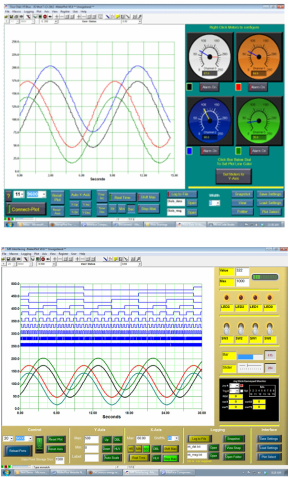 Combinations of analog and digital data can be plotted and data logged on any chosen GUI interface display. Analog data can be scaled (multiplied and biased) as it arrives BEFORE being plotted, so the raw results directly from an A2D converter can be scaled and biased before plotting as voltage, current, temperature, etc. in whatever units it represents with no pre-processing by the micro. And you can select the plot colors of up to 10 analog channels and 32 digital plots. MakerPlot allows your micro control and be controlled by your micro. You can "send to" and "read back" the values of your screen’s meters, switches, text boxes, etc. to allow two-way communications between your PC and micro. There is an entire section of our documentation devoted to this feature.